Ackley Bridge, the Channel 4 drama series about a new academy school that merges the lives and cultures of a West Yorkshire community, is filmed on the premises of a now closed comprehensive secondary school. 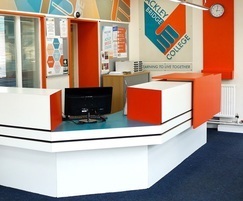 The former Halifax High School was transformed for the new TV drama and features the application of Formica® laminate to the reception desk and canteen tables of the school-turned-film set. Richard Downes, the Art Director on Ackley Bridge, comments: “The general feeling of the project was that we wanted to give our tired, run-down school a ‘lift’, to bring it up-to-date. The school itself had a blend of areas that were built in the 60s, 70s and 80s. We wanted to give the whole scheme an ‘Academy’ feel by adding modern colours and materials throughout. The palette matched our overall vibrant colour scheme. In addition, we felt that Formica laminate would provide us with a versatile and hard-wearing material that could potentially survive the rigours of shooting with children, and a film crew, for 5 years or more." 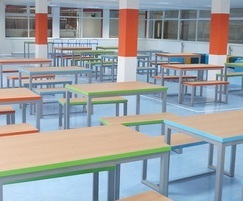 The choice of decors offered by Formica Group permitted the creation of a modern and sleek look for the school drama.